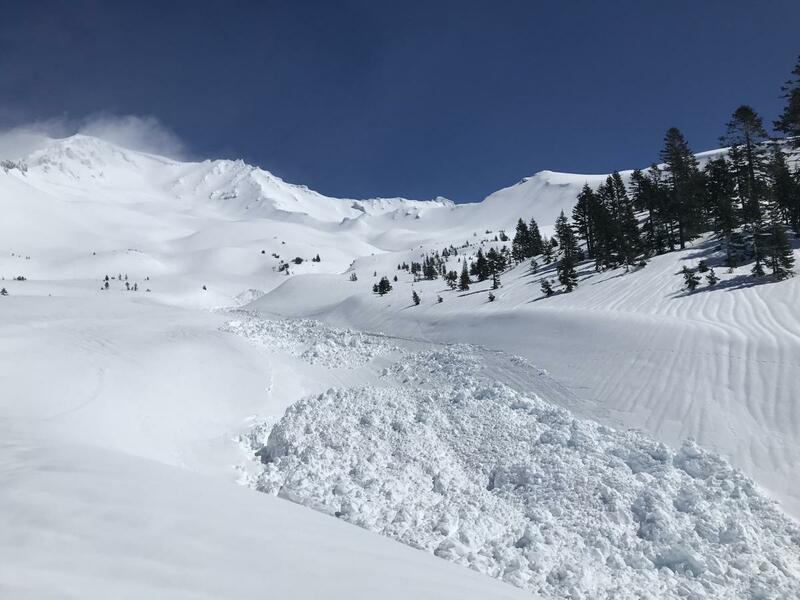 A large (R3/D3.5) natural loose-wet avalanche occurred in Avalanche Gulch between Saturday, April 6th and Monday, April 8th. This loose-wet avalanche likely released during a period of rapid warming and heavy precipitation. Best estimate puts this avalanche on Sunday, April 7th at 11 p.m. This avalanche left an impressive track and debris pile. The debris pile was 5-8 feet deep with spots up to 15 feet deep. the track was 20 to 50 feet wide and nearly a mile long. Low visibility limited observations of the crown. Destructive Potential: D3.5 = could destroy a large truck, small building, or break some large trees. The recent storm to impact the Mount Shasta area has been warm, wet and rainy. Since it began early Saturday morning (04.06.2019) 3.83 inches of water has fallen as rain at 7,600 feet on Mount Shasta. Above freezing temperatures have been recorded since noon on Saturday. An average temperature of 34 degrees F since midday on Saturday. This rain on snow has settled the snow nearly 10 inches over the last three days.